The 2D to 3D Realtime Video Conversion Script for Avisynth v0.3 was designed to be used for realtime conversion, but it can as well be used to get a permanent video converted from 2D to 3D. Sometimes you might just want to have a separate video already converted or your PC might for example not being able to handle 1080p content in real time. An example for converted video is the 1080p Avatar Trailer that you can download from the links below, the video file was just converted with the script so you can see what it is capable of. Just don’t forget that here I’m talking about automated 2D to 3D conversion which can usually provide good results, but they are not as good as what you’ll get from a video shot in Stereoscopic 3D mode. In order to convert videos to 3D with a file output, besides the AivSynth script you’ll also need to download the free video editor VirtualDub along with some codecs that are needed to handle the video and audio output. A good example for that would be Xvid for video and LAME MP3 for audio, but others might as well do… just have in mind that I’m talking about encoding here and not just about being able to decode these formats. You need to open VirtualDub and then Open as a video file the 2D to 3D AVS script instead of directly opening the video file you’ll be converting, don’t worry, the AviSynt script will do what is needed and will just pass video that VirtualDub can interpret. Then Open the Video menu, make sure that Full Processing mode is selected (on by default) and Open up the Compression menu, where you’ll see a list of compatible codecs installed on your PC. You can choose Xvid MPEG4 Codec and Configure it to use Single pass quality based encoding with a Quantizer of 4 in order to have a good ratio between compression size and image quality. Recompressing the audio is optional, but you’d need to do it as otherwise the file has PCM audio that just makes the size of the file too big. In this case you need to open the Audio menu, select the Full Processing Mode (here it is not on by default) and choose the Compression option. 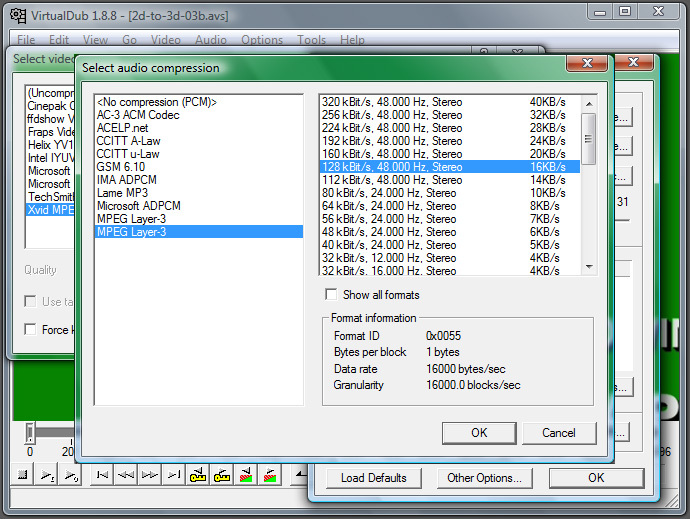 Again you’ll see a list of installed and supported audio codecs, here MP3 is just fine for Stereo output and you can choose 128Kbps for good enough quality and small file size. I have a 3-d glass that is not red cyan but normal 3d glass usually used in movie hall. I can’t view any 3d using u’r code….I have LCD monitor.Pls help. I have converted one movie using u’r script. pls help.Does the code also works for that glass? Thanks for this (someone sent me the link to here). I’ve been wanting to try some movie conversions, but based on this particular post and the other one about the conversion script…and forgetting about stereoscopic player….how can I do this to create a conversion as an anaglyph video file to view either on my PC or my DVD player which plays AVI…or even to burn to a blank DVD? Anything like this I’ve run across always talks about the stereoscopic player, but not about simply making an anaglyph file or DVD. But work with file created by fraps. Pls help me. I did as u said. but i am getting side by side video in my tridef media player. i can feel the depth in both videos. but side by side.i think i prefer row interleaved. i am having 3d laptop 120 hz display. i found out what is wrong, i m trying to convert .mkv (blu ray format) but it only converts .avi if I am not wrong. please confirm. @ Martin Haverland : i downloaded the Avidemux 2.5, please tell me the procedure to extract the audio and then attach it with the video of the output file. Hello and thank you for this guide… used a sample from TRON LEGACY to test on. It works alright except that it changed the aspect ratio for some reason. And as I am a noob at technical stuff I cannot tell you what codec and datastream and all those things are. The sample looks normal but the encoded 3d version is like the half of it ( from top to bottom)… any ideas? Then there is probably something messed up with the software on your system, it is not possible with Xvid compression to get 160 gigs video output from an 800MB source video. Did you try playing the script through Media Player Classic for example to see if you get proper image there? File size fix. Reinstalled the codecs. Just aspect ratio and sound problems now. The sound seems to be off after conversion. If the source video uses VBR audio then VirtualDub may have issues with it and the resulting sound may be a bit out of sync because of that. 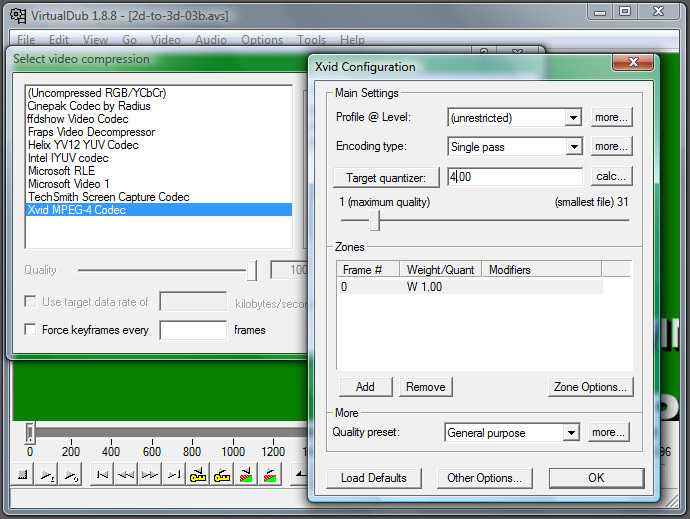 You can try with Media Coder as an alternative also to see if the aspect ratio issue will be fixed. Different Question: Would it be possible to record whatever a Stereoscopic Player plays on pc and convert that file so I can Burn it? Setting my tele to SBS 3D: It will stretch the 700 to maintain the 1400… which is sad :(… Any idea how to fix this issue? The television is a PANASONIC VIERA TX-P50VT20B 50″ Full HD 3D Plasma TV…. Ok.. tried playing around with the script. Tried the Up/down and interlaced modes… definitly did not work. Is there somewhere in the script where i can change the resizing thing? For Side by Side it is normal that the script will double the width, because you have the left and right frames next to each other. With Above/Below mode the height will be doubled. When switching the TV to Side by Side mode it should split the video frame in half and display it properly at least in theory. You can try to upscale the output video to match Full HD resolution as closely as possible, but depending on the input video’s aspect ratio that could be a problem. You can also try with a half horizontal resolution (squashed) if the TV does not work well with full resolution frames in either Side by Side or Over/Under modes. Ok Bloody. Thank you for all your help. But no matter what settings I use (either in VDub or MediaCoder) to save the file or what dimensions the output should be – the result is always the same: 1440*304. Even when I set the output to Full HD ( 1920*1080) it will give me the above mentioned dimentions. Hello again. I managed to get a sort of 3D effect within Sony Begas 9. My question now is: What makes the AVS script giving the result the field of dept? Can someone give me a script or say how to use this script for 3D BluRay (L+R) -> Anaglyph??? I get an error message when trying to open the avisynth 2d to 3d script. James, what error message are you getting? Did you install the AviSynth executable? How would you convert an mp4 format video to an avi format video so that i could turn it into 3d? Or is there a different script for turning mp4 2d videos directly to 3d??? i still curious about 3D converter. high just converted a avi all good but movie plays in side by side how do i make it one screen ? Is it working? any body tested here? can I use red/cyne blue glasses in my dell inspiron 1564 having i3 core processor, 4 gb ran and 512 mb ati graphics card? Yes, you should have not trouble making anaglyph 3D glasses work.